Welcome to the Time Wholesale Services website terms and conditions for use. These terms and conditions apply to the use of this Website and by accessing this Website and/or placing an order you agree to be bound by the terms and conditions set out below. If you do not agree to be bound by these terms and conditions you may not use or access this Website. If you have any questions relating to these terms and conditions please contact our Customer Service team by e-mail, or call us on 0208 595 7830 during trading hours. "Conditions" means these terms and conditions and the Special Conditions; "Product" means a product displayed for sale on the Website; "Product Description" means that part of the Website where certain terms and conditions in respect of the individual Product are provided; "Special Conditions" means the terms and conditions in the Product Description; "Users" means the users of the Website collectively; "Personal Information" means the details provided by you on registration; "We/us" means Time Wholesale Services; "Website" means the website located at www.timews.co.uk or any subsequent URL which may replace it; "Cookies" means small text files which our Website places on your computer's hard drive to store information about your shopping session and to identify your computer; "United Kingdom" means England, Wales, Scotland, Northern Ireland and the Channel Islands and "You" means a user of this Website. You will notify us immediately of any changes of account information by contacting our Customer Service Helpdesk by e-mail, or calling us on 0208 595 7830. When you use our website, you'll see that we offer you related products, showing products we think you might like and could perhaps miss when you're browsing the site. We determine related products through our market knowledge, current trends and Brand Owner research and activity. We will treat all your Business and Personal information as confidential (although we reserve the right to disclose this information in the circumstances set out below). We will keep it on a secure server and we will fully comply with all applicable UK Data Protection Act. We will send you an order acknowledgement email detailing the products you have ordered. This is not an order confirmation or invoice. You are entitled to cancel your contract if you so wish, provided that you exercise your right before the product is despatched. Under the Licensing Act 2003 it is an offence to purchase or attempt to purchase alcoholic liquor if you are under the age of 18, or liqueur chocolates if you are under the age of 16. In accepting these Conditions you agree to provide Time Wholesale Services truthful and accurate information and act in accordance with the Licensing Act of 2003. 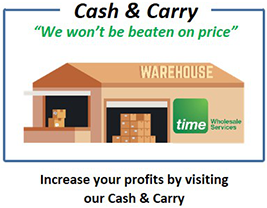 Time Wholesale Services (UK) Ltd is independent wholesaler that predominantly trades in Fast Moving Consumer Goods and is a Company incorporated at companies’ house under registration number 03002900. We gather and process your personal information with the privacy notice and in compliance with the relevant data protection regulation and law. This notice provides you with the necessary information regarding your rights & obligations, and explains how, why and when we collect and process your information. For our services; credit, delivery, online payment and website - to be able to work properly and to do all the things that you expect them to do. To comply with our legal obligations with HMRC, AWRS and Money laundering Regulations. We collect personal information that you share with us when you contact us or interact with us in person at our stores, through our website, email, phone, stands and events, or otherwise. For example, you will provide information to us when you contact our customer service teams to register your business to shop in store, connect through Website to place an order, complete a credit application, register to make payment by Direct Debit, make an online payment through Sage Pay, complete online survey or questionnaire to rate one of products or service and enter into a competition or prize draw. Through these interactions you share with us: your name, address, e-mail address, contact number and payment information. In some circumstances, we will need that information to be able to provide you with our promotional activities, promotional products or service that you have asked for; for example, we need your payment information when you buy a product, and your address to deliver it to you. We take your privacy very seriously and will never disclose or share your personal data without your knowledge unless we are required to do so by law. To communicate with you about daily, weekly and monthly promotions. To provide you information, about our services or products that you request form us. For customer satisfaction surveys to enable us to identify where service and product improvements can be made and to allow us to improve your experience. To provide updates to you about any changes to TimeWS’s policies, terms and conditions and any other matters which we may need to tell you. 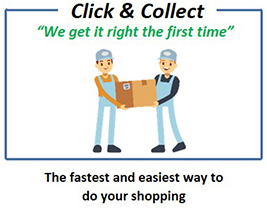 To assist in any disputes, claims or investigations relating to your purchases in store or delivered. To detect and prevent fraudulent transactions in store or online. We do not share or disclose any of your personal information without your consent, other than for the purpose specified in this notice or where there is a legal requirement. You can ask us to delete this information at any time by contacting customer service on 0208 595 7830 or by e-mailing our customer service team at reception3@timews.co.uk. When you set a password, it’s a good idea to use a mix of numbers and characters, and something that’s very personal to you. You can re-set your password any time by signing into your account and choosing the Edit your password option. If you've forgotten your password, just enter your email address on the 'Forgotten your password' page, and we'll email you your password information. Then simply follow the instructions in the email to change your password. We'll never ask you to send any personal details via email. If we require such details, for security reasons we'll ask you to contact us by phone. Should you receive an email claiming to be from Time Wholesale Services Ltd requesting this kind of information, please don’t respond, but do let us know about it. (a) Each contract between us, Time Wholesale Services, and you, the Customer, will automatically incorporate these Conditions which will prevail over any conditions stipulated or referred to by you. No amendments will be binding on us unless confirmed by us in writing - our sales representatives and delivery men have no authority to agree to any other terms. Your order will be taken as acceptance of these Conditions. Acceptance of any tender or a quotation made by us will not of itself constitute a contract. (b) In any event by acceptance of deliveries the Buyer shall be deemed to accept the Terms and Conditions contained herein. We do not operate a sale or return policy and orders will be for not less than the minimum quantities operated by us from time to time. The price quoted is for the specified quantity only and will not apply to an order for any lesser quantity. All quotations for products to be delivered from stock are subject to those products being unsold on receipt of the order. (a) We may alter prices to those current at the date of despatch. All prices quoted exclude VAT which is payable in addition. (b) The Buyer hereby agrees that in the event of any cheque being dishonoured or returned to the Seller's Bank, unpaid for any reason, the Seller shall be entitled to debit the Buyer's Account with the sum of £35.00 for each representation. (c) In the event of an account being opened in the name of a Limited Company this Company reserves the right to require that one or more of the Directors of the Company enter into a personal guarantee with this Company guaranteeing payments of all monies which may have become due to this Company. (d) If legal proceedings are issued against the buyer for any monies owed, the costs of so doing will be added to sums owed by the buyer. The buyer will also be responsible for unrecovered legal costs. Prior to issue of a summons the sum of £75 will be added to the amount owed by the buyer. The buyer will also be responsible for third party collection costs as by any third party agents we nominate. Interest will be charged at 10% per month on overdue amounts. (a) Delivery dates are approximate only and do not form part of the contract. 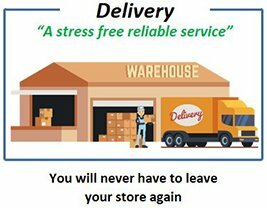 Delivery to your premises or those of your named ('Agent') will constitute delivery for the purposes of these Conditions except where yours or the Agent's premises are not on the mainland of England, Wales and Scotland when delivery to a shipping agent will constitute 'delivery'. All deliveries are in any event subject to availability of stock supplies and labour and no liability will attach to us for any loss or damage including indirect or consequential loss (e.g. loss of profit or loss of contracts) of any kind arising out of any delay in delivery nor will any delay or failure in delivery or performance entitle you to refuse to accept any delivery or other performance of or to repudiate the contract. Each delivery is to be considered a separate transaction and the failure of any one delivery will not affect the rest of the contract. (b) You will be deemed to have accepted products and being in accordance with your order unless we are notified at the time of delivery. (c) Risk in the products passes when they are delivered. If you fail for any reason to take delivery on the due date (a) delivery will be deemed to have taken place on the due date (b) Risk in the products will pass to you and (c) you will indemnify us in respect of any loss or expense including storage and insurance charges arising from your failure. (d) We will not be liable for any damage to property arising from the delivery of goods into the buyer's premises. Delivery shall only be made to the kerbside at the stated delivery address. Time Wholesale Services accepts no responsibility for any damages caused to the buyers property whatsoever. (e) If the buyer invites the employees of the seller into his premises then the buyer shall be liable for any injury caused to the seller's employees whilst on the buyer's premises. (a) Despite the earlier passing of risk, title in the products will remain with us until the amount due under the invoice for them has been paid in full. Until title passes, you will hold the products as bailee for us and will store or mark them so that they can at all times be identified as our property. (b) You are licensed to sell the products and will immediately, on receipt of the proceeds of sale, remit to us the full purchase price of the products. Pending payment and the passing of title, the entire proceeds of sale will be held in trust for us and must be at all-time identifiable as our money. We will be entitled, at any time before title passes, to terminate the licence and/or to repossess and sell the products and for that purpose to enter your premises. The License will cease automatically if an administrator or administrative receiver or receiver is appointed over any or your assets or if you allow a petition to be presented or pass a resolution for your winding up or otherwise become insolvent or make any arrangement or composition with your creditors. (c) We will be entitled to maintain an action for the price of any products even though title in them has not passed to you. You will, if required, assign to us your rights against third parties to whom you have supplied products for which you have not been paid. (d) The rights set out above are in addition to all rights and remedies otherwise available to us at law and/or in equity. Where products, containers, packaging or are manufactured and/or supplied to a recipe specification or instructions supplied by you warrant that such recipe specification or instructions will not result in the infringement of any rights (including without limitation any rights in respect of confidential information or trade secrets) belonging to a third party and will indemnify us in respect of any loss or expense (including legal fees) which we may incur in connection with any such claim or threatened claim by a third party. (a) These Conditions contain all the terms under which contracts are entered into by us and except as specifically mentioned no warranty or condition as to description, condition, quality or suitability for purpose whether collateral to the contract or otherwise given (or deemed to have been given) or implied and any statutory or other warranty or condition whether express or implied and whether collateral to the contract or otherwise is hereby excluded. (b) Products sold in the UK are intended only for sale and consumption in the UK. We accept no responsibility whatsoever or howsoever arising where products are exported from the UK regardless of whether we knew or ought to have known that the products were to be exported. (c) We will not be liable to you (other than for death or personal injury resulting from our negligence) except in accordance with this Condition for any loss or damage of any kind arising from any breach of any express or implied warranty or condition of the contract or from any negligence or breach of statutory or other duty by us or in any other way in connection with the performance or purported performance of or failure to perform the contract. (d) Where European Article Numbers Codes and Symbols ('Codes') are applied to our products we will not be liable for any loss or damage suffered by you arising out of the use of codes. However, if the code was incorrectly supplied by us, we will at our option replace such products or allow you credit for their invoice value in full and final settlement of our liability. (e) If you establish and notify us at the time of delivery that any products have not been delivered or have been delivered damaged or are not of the correct quantity (subject to Condition 2 above) or do not comply with their description or are defective, we will at our option replace such products or allow you credit for their invoice value in full and final settlement of our liability. (f) In no circumstances will our liability to you exceed the invoice value of the products nor will we be liable for any indirect or consequential loss including loss of profit business or contracts howsoever arising. (g) You will indemnify us in respect of any loss or expense which we may incur in any actual threatened claim or action whether civil or criminal howsoever arising in connection with your failure to comply fully with your obligations under the contract with us or generally under statute or other legislation or codes of practice etc. whether or not incorporated in these Conditions or any other contract between us including but without limitation the Consumer Protection Act 1987 (as amended or modified from time to time) and any codes made under or by reference to it. We will not be liable for any delay or failure in the performance of our obligations under the contract caused by factors outside our control including but without limitation delay or failure in the performance of sub-contractors by reason of factors outside the control of the sub-contractors shortages of raw materials, supplies, labour and transport. (a) No orders may be cancelled without our prior notice and we may subcontract the performance of the contract in whole or in part. (b) We may suspend or terminate the supply of products if you fail to make any payment or otherwise default in any of your obligations under the contract or any other agreement with us or become insolvent or have an administrator or administrative receiver or receiver appointed over your business or you are compulsorily or voluntarily wound up or if we in good faith believe that any of those events may occur. (c) Any notice to be given under the contract will be in writing and telexed or forwarded by first class prepaid letter to the receiving party and will be deemed to have been given on the date of the telex or on the day following that on which the notice was posted. (d) No goods shall be returned to the Seller without prior authorisation of the Seller. (e) The construction and performance of these Conditions will be governed by English law and all disputes which may arise under, out of or in connection with or in relation to these Conditions or their subject matter will be referred to a single arbitrator in accordance with the Arbitration Act 1950 or any statutory modification or re-enactment of it for the time being in force. (f) If the sum owed to the supplier remains outstanding, the supplier shall have the right to enter the purchasers premise and remove goods to the value of the sums outstanding on the purchasers account. The said goods whether supplied by Time Wholesale Services or not shall be sold to reduce or extinguish the purchasers' indebtedness to the supplier. From 1st of April 2017, Wholesalers will not be able to sell alcohol in the UK unless they are registered for Alcohol Wholesaler Registration Scheme (AWRS). Similarly, businesses that trade in or retail alcohol will need to make sure that they buy from AWRS - registered licence holders. For a retailer, it is very simple. Request the AWRS number of your wholesaler and check that the number is valid on the government website. Print a copy for your reference.